On Tuesday, Prime Minister, Theresa May called for a snap general election to take place on 8th of June 2017, asserting that the “election is needed to help Brexit”. The next general election had been due to be held in 2020, but the Fixed Term Parliaments Act allows for one to be held earlier if two-thirds of members of Parliament (MPs) are in favour – which they were, with a 98% approval rate (522 votes to 13). Following the results of the vote, George Osborne announced he would be stepping down as a Member of Parliament in order to take up the editor’s chair at the Evening Standard newspaper, declaring that ‘the public need from the media the straight facts and informed opinion to help them to make the big decisions Britain now faces about the kind of country we want to be’. Theresa May has since announced that she will not be taking part in any head-to-head TV debates in the run-up to the election, sparking criticism from rival parties, stating that she preferred to “get out and about and meet voters”. The first round of the highly anticipated French election is almost upon us. Voting will be taking place in just a couple of days (Sunday 23rd), with the OpinionWay poll currently showing that independent candidate Emmanuel Macron (23%) and the National Front’s Marine Le Pen (22%) are positioned neck and neck. 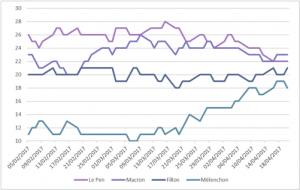 We have been keeping a close eye on poll movements over the past month and have seen a noticeable tightening this week as François Fillon (21%) and Jean-Luc Mélenchon (18%) have gained ground. Bookmakers are currently predicting Macron to win. However, opinion polls and bookies are not always reliable indicators, as was proved last year. Nevertheless, Mélenchon’s and Le Pen’s attacks against the European Union (EU) and the euro may work against them as approximately 72% of voters surveyed by French international polling and market research firm, IFOP want France to remain a member of the European Union and to keep the euro. However, according to Emmanuel Rivière, CEO of Kantar Public France (a global political and opinion research practice), only 60% of voters are certain of their choice for the first round of the election. 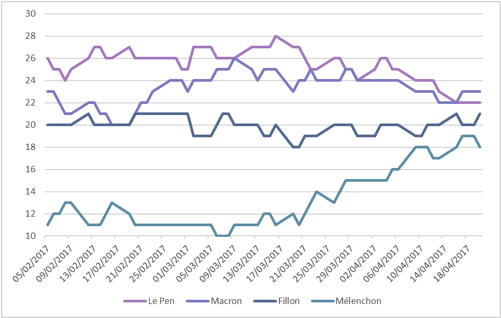 In the event that Macron and Le Pen are the two candidates to make it through to the second round, taking place on 7th May, Macron is tipped to win the runoff vote by 65% to 35% (not to be confused with the above graph which relates to the first round). If the status quo is maintained and pro-Europe centrist Macron is elected, this would reinforce investors’ confidence in the EU and substantially reduce political uncertainty. The International Monetary Fund (IMF) upgraded its forecast for UK growth this year. 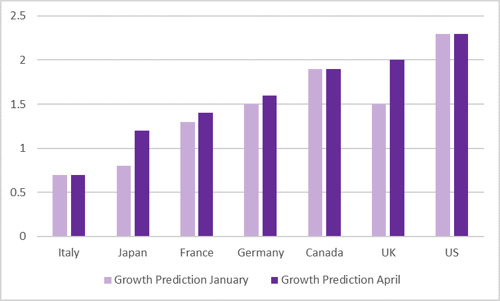 After an initial backtrack on its pre-referendum warnings of possible recession, the IMF has raised its forecast for UK growth this year from 1.5% in January to 2%. Compared to other major developed countries, this represents the biggest upgrade and the second fastest-growing economy after the US. The IMF’s upgraded forecast for UK growth coincided with Theresa May’s call for an early UK general election. The Prime Minster signalled that the resilience of the economy had given her the confidence to seek parliamentary approval for a snap election. Despite predictions of immediate financial and economic danger, consumer confidence has remained high, record numbers of jobs have been created, and economic growth has exceeded all expectations. The IMF stated that growth had “remained solid in the United Kingdom, where spending proved resilient in the aftermath of the June 2016 referendum in favour of leaving the European Union”. Furthermore, the IMF is more optimistic about prospects for the global economy, expecting an expansion of 3.5% in 2017 (up from its forecast of 3.4% in January) and 3.6% in 2018. It said the risk of recession over the next 12 months had fallen in almost every global region since October.